Fairy, funny but no tale about the fact that no company exists without customers. And if sometimes, boss turnover seems to be a sporting challenge for shareholders, customer can’t wait. And may have the last word. It’s finally if you understand it, when you will make great deals, those called “win-win”, with the genuine relation between someone who has needs you can afford. And if sometimes your real boss tries to make it his own way, remind him that he can’t exist without customers…Everybody in his company might be confronted with this and face, hold and build the true relevant relation. 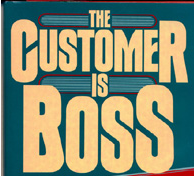 Because, customer is the boss in fact, and the matter of anybody in the company. And it seems urgent to see, integrate and share the concept inside companies, to deliver different ways. Why does it seem so strange and how handle it? the business is growing on average consumption with either, more customers, more loyalty or raising the level of engagement: in any case, you do need customers…any customer but customers! the customer knows much more you ever imagine about your market and your products, and value your service: don’t forget he compares live, all the offer of the market for you. If he gives you an advise, he’s probably less blind than you! even if you think “customer doesn’t know what he wants or what is good for him”, his/her help would be precious, targeting the next big picture. If you build something with him for he’s already part of it, why won’t he buy then? like Sam Walton said “There is only one boss. The customer. And he can fire everybody in the company from the chairman on down, simply by spending his money somewhere else“. I guess Wal Mart knows how to cope with it, don’t you think?